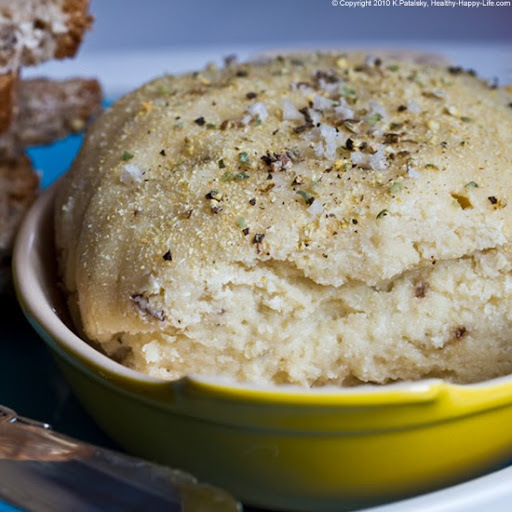 Vegan Cashew Cheese. Herb Crust. Velvet Center. 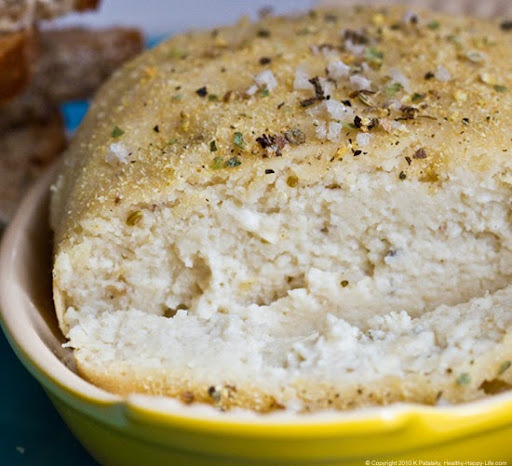 Let's get this Vegan Cashew Cheese party started. I love party-platter-approved vegan cheese. 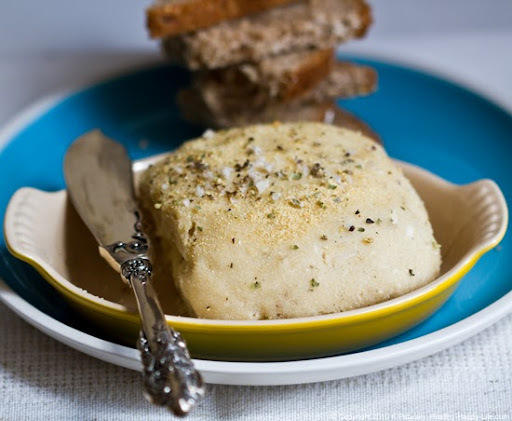 So I'm simply giddy that after many months of hit-and-miss vegan cheese experimentation I've finally perfected a recipe that I adore. 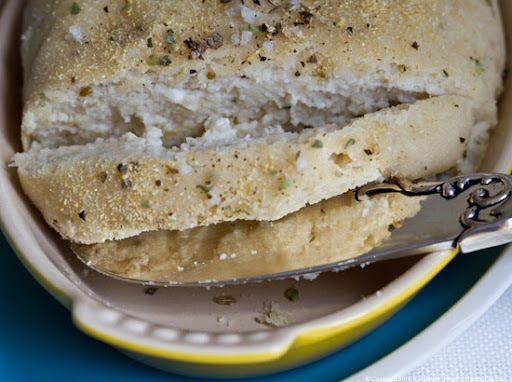 Pop the bubbly, it's vegan cheese party time..
Crusty Meets Velvet. The outer layer is dry and fluffy with a gently crisp toast-like shell, while the deep core is smooth and velvety. The cheese round stays firm enough to slice - yet melts in your mouth. Super spreadable. Three Ingredients. 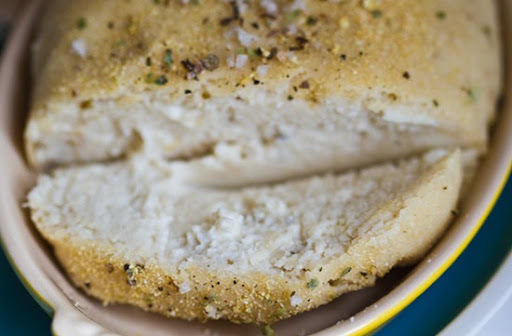 This herbed salt-crusted cashew cheese is simple with only three ingredients (cashews, water and herbed coarse sea salt). The process is specific - yet totally newbie-approved. Anyone can do this. No Master Cheese-Maker Certification required. Soak your cashews today and be enjoying your cheese by tomorrow night! Woo hoo. 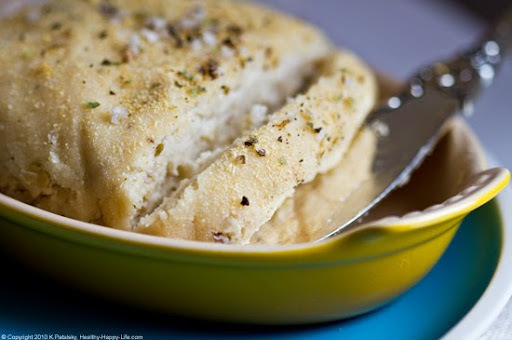 Details on this scrumptious cheese..
Husband-Approved. Before I pass any recipe onto you guys I always send it through my husband and his super-picky taste buds. He is not a fan of dairy so he is a big fan of vegan cheeses like Daiya and Dr Cow - just like me. Taste Test: I made him a lavish after-work spread of cheese, rice crackers, harissa, lemon juice/EVOO dip and champagne - he loved it. This cheese is like nothing I've ever tasted before. The flavor and texture is unique and cravable. Served Warm or Cold. You can serve this cheese warm and crisp-crusted straight out of the oven - or you can chill it in the fridge for a few hours to chill it firm. If you chill it you will loose a bit of that fluffy outer crust, but the cheese will harden a bit more than the warm super-velvety version. I loved it both ways, it just depends on your mood and your tastes. Before you start, you'll notice I've included a list of tools in my "ingredients" list. You CAN do this. It's easier than you think..
1. 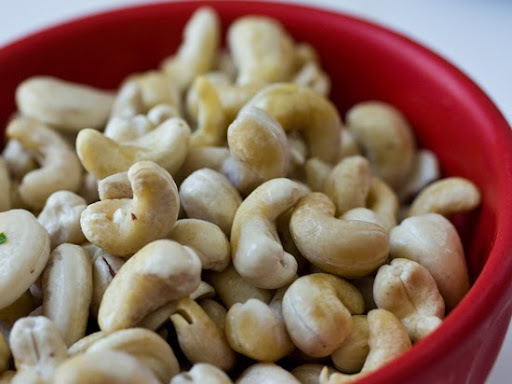 Soak your cashews in salted water overnight or at least 8 hours. I soak mine on the counter top - covered. 2. Drain your cashews - but reserve about 1/2 cup of water, maybe more. 3. 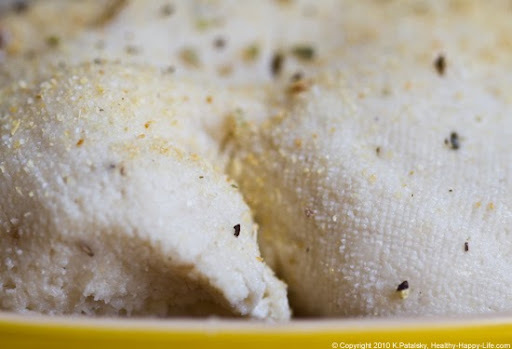 Add your cashews, salt and 1/2 cup salted soaking water to a food processor. Blend until as smooth and velvety as you can possibly get them. 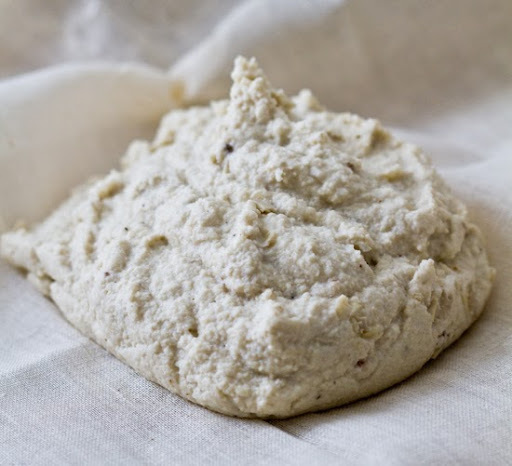 You want the consistency to be that or a thick ricotta cheese. If you need to add more water - do so. But don't add too much and get a soggy mixture. 4. 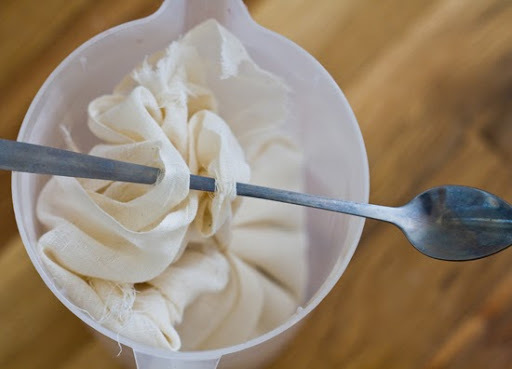 Set up your cheesecloth and pour the mixture into the center of your cloth. 5. 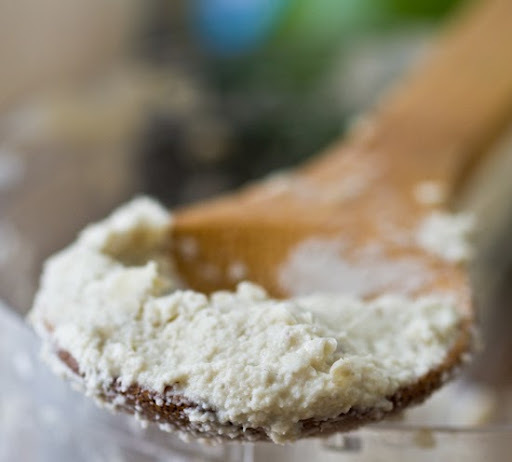 Wrap the cheese mixture in a tight bundle and tie with a rubber band or string. 7. 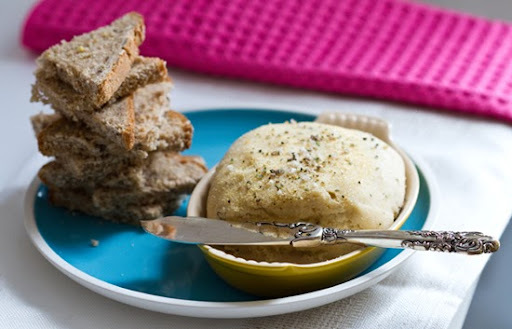 Allow your cheese to "drain" at room temperature for 2-4 hours. 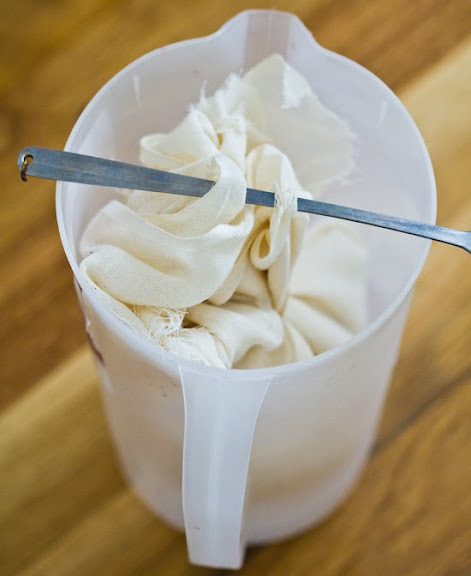 Some cheese mixtures will drain a bit of liquid off and some will simply dry out and the water will soak into the cloth. Today my cheesecloth was super dry and no actual water collected in my pitcher - but the cheese cloth soaked up a good amount of moisture. 8. Next, place you cheese (still in the bundle) in the fridge. You can either leave it suspended over the bucket, or your can wrap it in an extra layer of cloth and place in a bowl in the fridge. Either way works. 9. Let chill overnight or at least a few hours. 10. Remove the cheese from the cloth! It should be in a nice firm ball now. Some of the moist cheese shell may stick to the cloth - that's OK. Just be gentle removing the cheese. 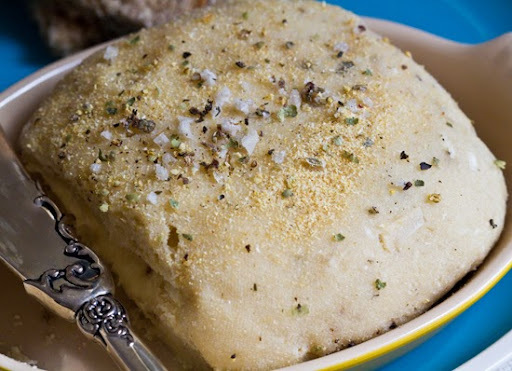 Plop it into an oven-safe serving cheese dish. Sprinkle a bit of herbed salt and pepper on the top of it. I added a dash of garlic powder for color, texture and flavor. 11. 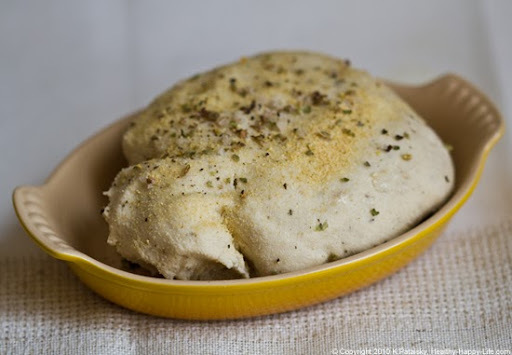 Place in a 200-250 degree oven to bake for 45 minutes-2 hours. If doing 2 hours be sure to have your oven turned to 200 degrees or even a bit lower. 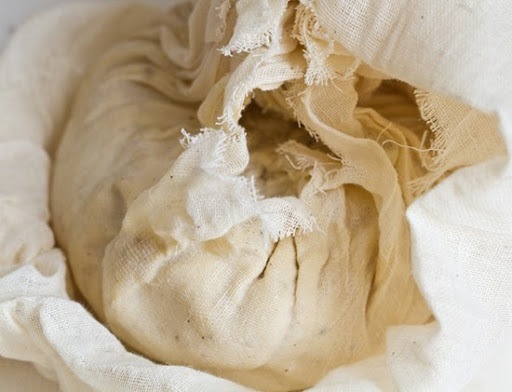 This process will slow-bake the cheese, drying it out without "melting" or burning it. I baked my cheese at about 215 degrees for 90 minutes. 12. Remove cheese and allow to cool a few minutes before serving. 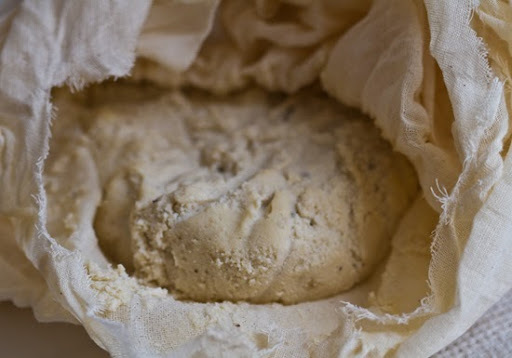 Or you can allow to cool in fridge for at least an hour, or overnight for a firm cheese with a less crisp crust. 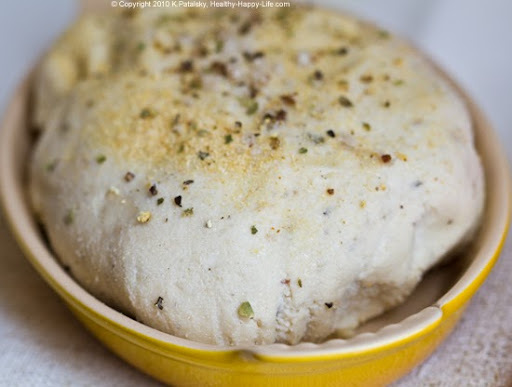 Serve with crackers, bread, veggies and more. I added a spritz of EVOO and lemon juice to the top of my cheese before serving for an extra layer of flavor. Gourmand-Approved Creative Flavor Options. What about.. Harissa Cheese. Basil Cheese. Peppered Cheese. Lemon Cheese. Pumpkin Cheese. Sweet Maple Cheese. The options are endless. 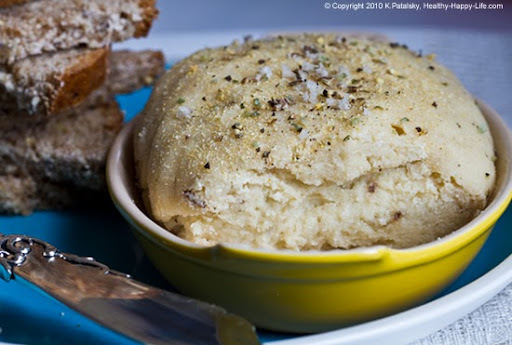 So once you get familiar with this basic recipe you can experiment with all sorts of "cheese" flavors. Aged Nut Cheese. 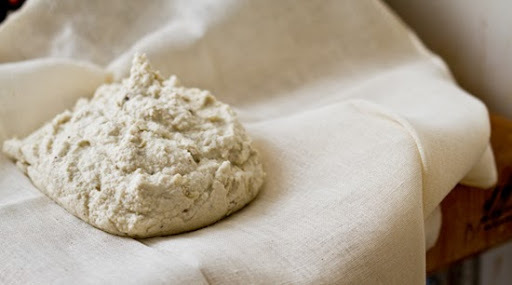 One of my fave nut/cashew cheeses is the raw cheese by DrCow. 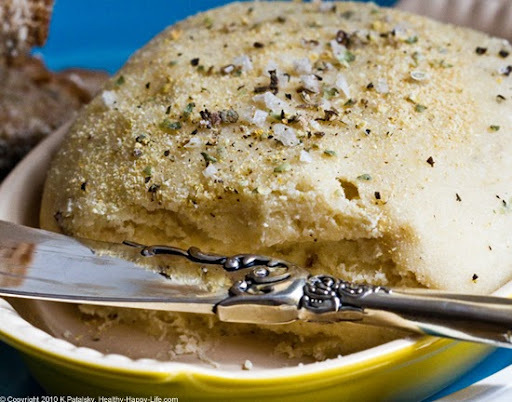 They add vegan acidophilus and allow their cheese to age - the flavor forms into a tangy, creamy, rich bite that is amazing. While I haven't mastered aged cheese yet - I am experimenting with adding acidophilus to this recipe and seeing what happens. I'll post any good results and recipes in the future. There is a lot of complex chemistry that goes into aging cheese and I really would like to learn eventually. Any hints or tips? Let me know.. It Almost Looks Like Dough! But it doesn't taste like it..